We try to keep our operation as simple as possible so that you may enjoy a worry-free dining experience. 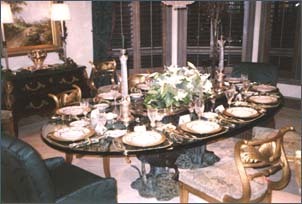 style of service, such as buffet or table, which in turn will determine if any rental items are needed. establishing a menu or menus with predetermined time of serving starting with the appetizers. As you will see I have tried to include in the menu a list of ingredients, mainly for taste purposes and allergies, also sometimes a brief personal opinion. On or before the event, depending on the size and complexity of the meals, we do all the necessary shopping and bring it to your location. We look for the freshest ingredients, herbs, meats and sea food. Besides the Chef's talent, a great meal is only as good as the ingredients. As we cook on site, we will need to know the hours of accessibility and the person with whom we need to stay in contact in the event you have any last minute changes. Appetizers are served at the appointed hour, in the location of your choice, followed by the meal itself with the proper service. We pay attention to the smallest detail as we feel service is as important as the meal and presentation. We clean up the kitchen and dining areas after the event. Our references and fees are available upon request. Copyright Â© 1997-2019 Ara Gureghian. All Rights Reserved.